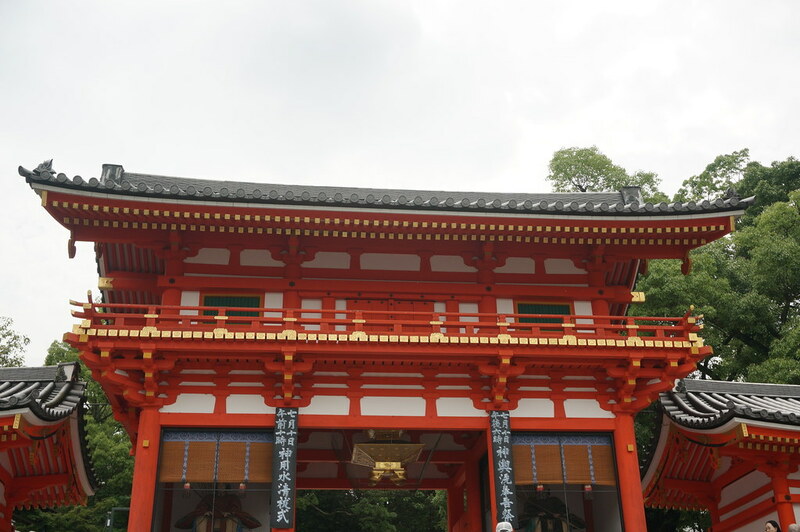 Kyoto is a city of over 1.5 million people, tiny by Chinese standards, and yet it has over 2000 temples and shrines including 17 designated as UNESCO World Heritage. 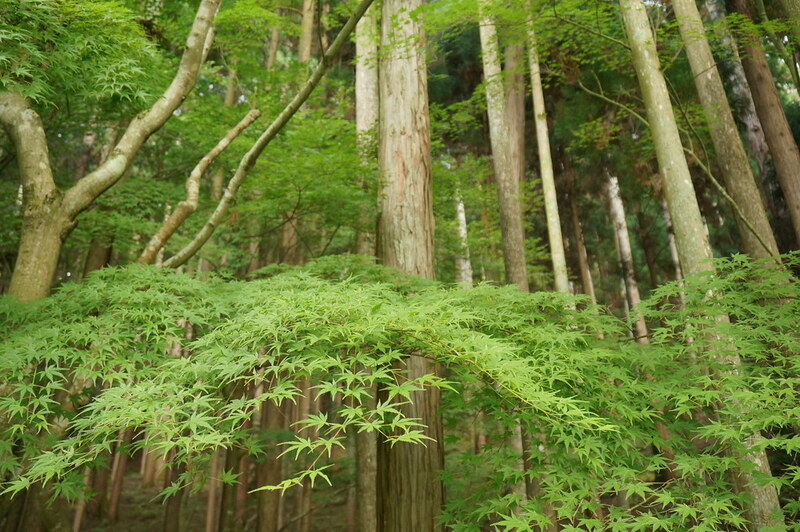 Kyoto is synonymous with Geisha, cherry blossom and temples. 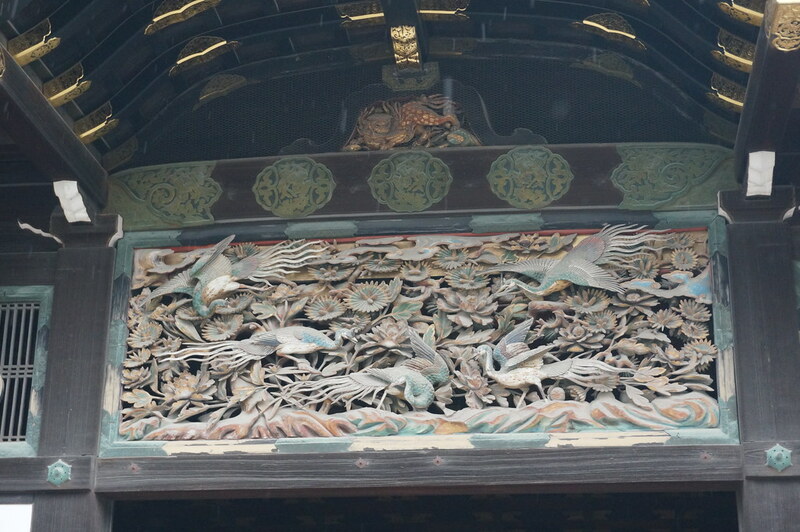 We missed the blossom but glimpsed some Geisha and have seen a fair amount of shrines and temples. 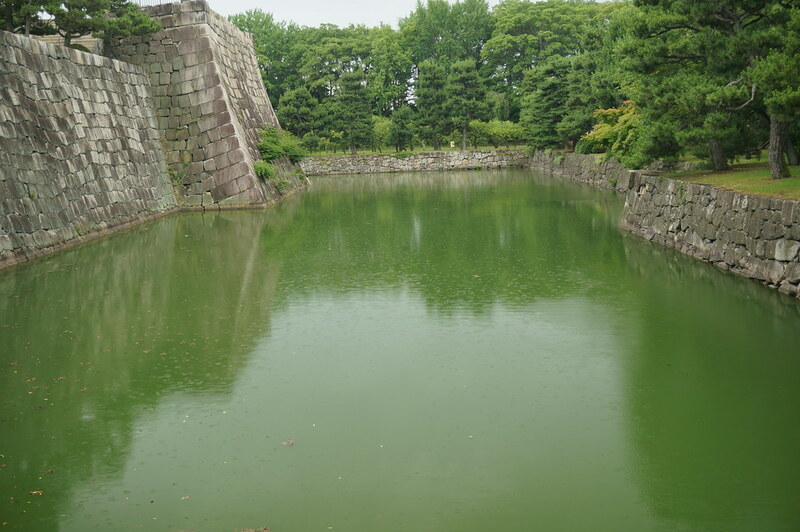 The history of the city is very expansive, being capital the city of Japan for over a 1000 years, it’s name means capital city. Many of the places we visited were actually old, a nice change to China where most places were replicas. 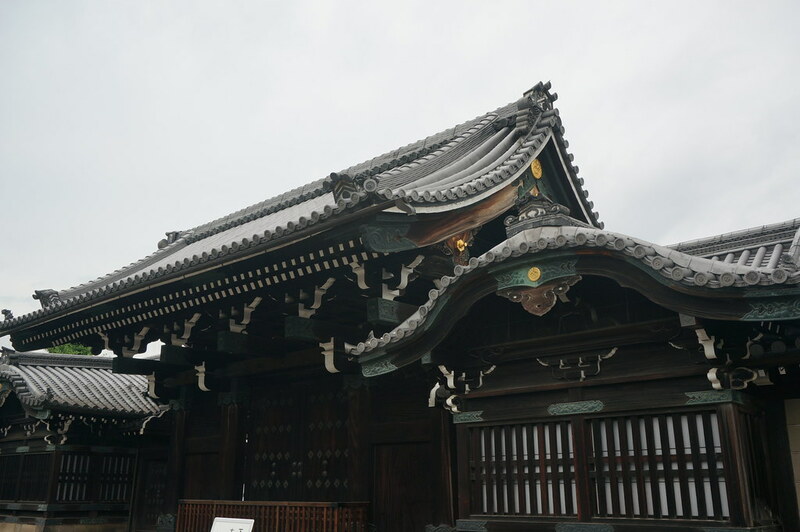 However, many of the original temples in Kyoto caught fire, so most of our visits were to the rebuilt structures from the 1600s, a time of restoration. (I need to do a lot of reading on Japanese history). 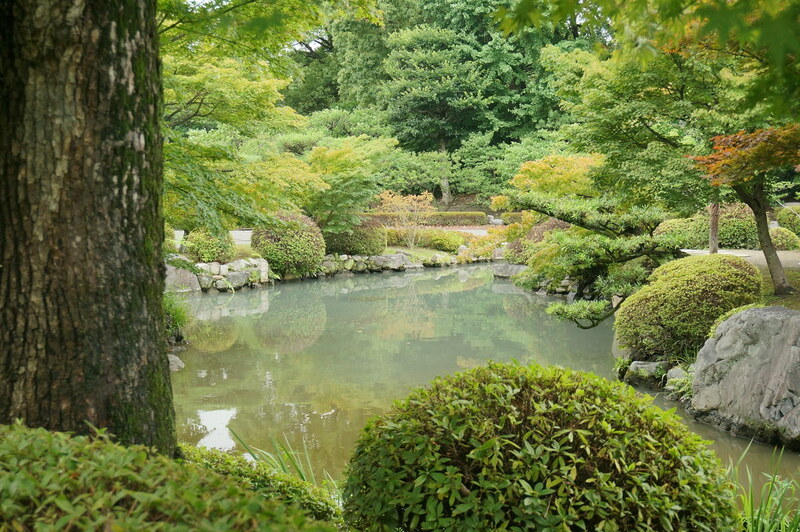 Kyoto has many beautiful areas and we have to thank our American cousins as they chose not to drop the Atomic bomb here, believing it to be an intellectual hub and a place of beauty. 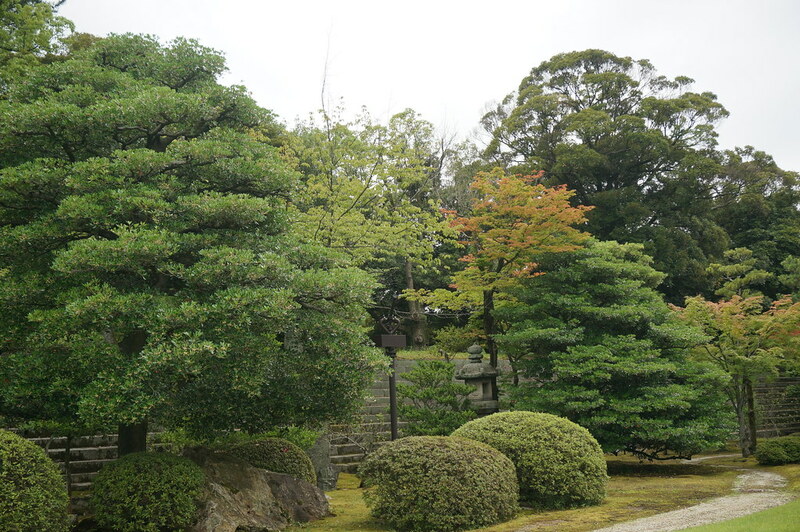 Kyoto was on the original shortlisted five cities to have the atomic bomb dropped on. 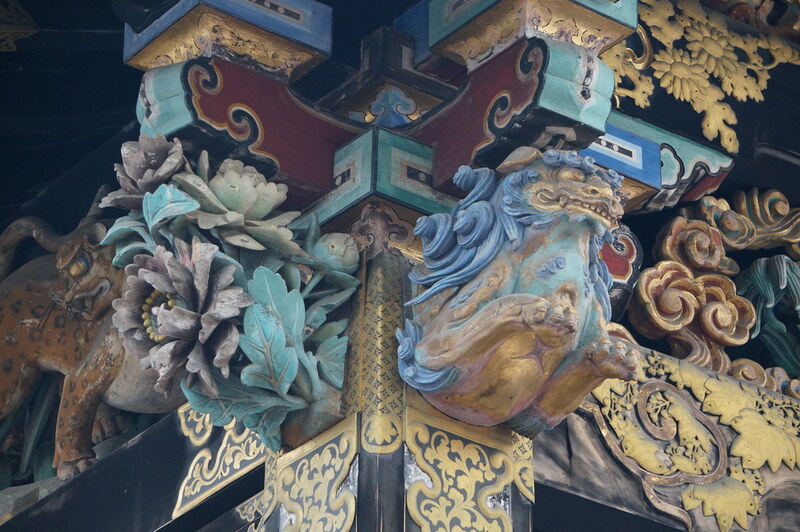 The many historic sites are going through another round of restoration with scaffolding still on some famous places or luckily for us just being removed as was the case with the Phoenix Hall, a national treasure and on the ¥10 coin. We arrived from Himeji by train, a short distance in comparison to our usual journeys of the last month or so. Japan being a similar size to the UK with an excellent transport system, making it easier to get around. Dropping our luggage off at the hotel we made our way to Nijo Castle. We decided to come here because it was listed by UNESCO and was near the hotel, we were changing hotels the next day. 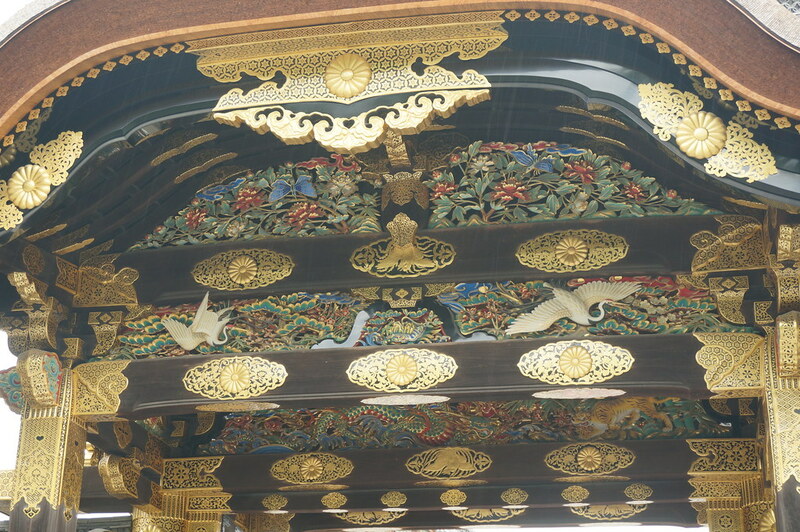 Nijo castle has been undergoing restoration and the covers had just come off the outside of the building. Inside there were many empty rooms with some paintings on the panels and Shoji. Not much to see and no information inside. We had made the assumption there would be information panels and chose not to get the audio guide. Instead we wandered in our socks on creeky floorboards looking at tatami mats and wood paneling. After this we went to the gardens, much nicer and no need for information as I can tell a tree when I see it! Then it rained! We ploughed on as this was expected since it is rainy season. Our next stop was just up the road, so we thought. The rain got heavier and after 10 minutes the road was flooded and our single umbrella was not keeping us that dry. We turned back and headed for the subway and to check-in at the hotel. Japanese hotels don’t allow you to check-in until after 3pm and they stick to it belligerently. It was around 5pm anyhow, so we decided to plan the next few days in Kyoto, in order to try and visit as many World Heritage sites as possible. With over 2000 temples and shrines we decided this would be the best thing to do, we assumed UNESCO would pick the best places. It was still pouring down when we had finished planning and so we went to a restaurant nearby. We had a very succulent beef burger for tea, cooked in front of us. It was very nice. My burger was topped with real mozzarella and a beef tomato, Andrew had aubergine and something else on it. Tasty! 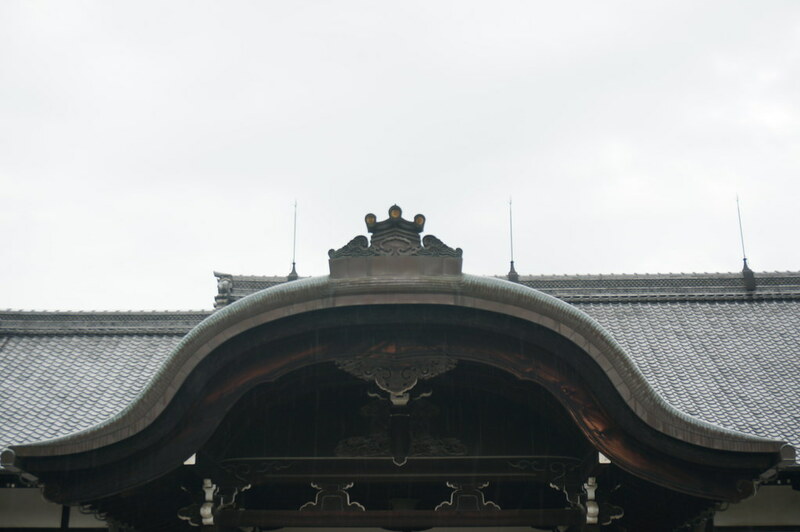 On our first day we learnt that Kyoto has as many restaurants as temples and that it really does rain lots in rainy season. We also found that it costs a lot more than the rest of Asia, understandably since the average salary is more than in the UK. We had the annoying task of changing hotels. 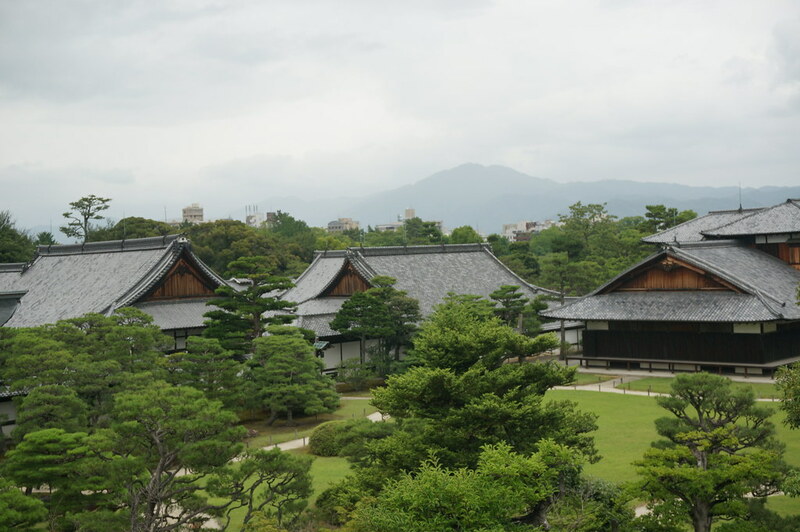 It was the weekend when we arrived in Kyoto and the hotel we preferred was very expensive, so we’d spent the one night in a cheaper hotel then booked two nights in the next hotel once the weekend was over and prices came down. Today was very humid! After confusion in the train station due to the fact it has an underground line and then a private underground line next to each other. We then bought the wrong day pass (a child’s one!) and we still got on the subway though. We only realised our error between stations and went to see a very nice Japanese Rail staff. He was polite and spoke fairly good English. Tickets swapped, we made it to our new hotel. Spotting a French Bakery, we bought a croissant and pain aux raisins. 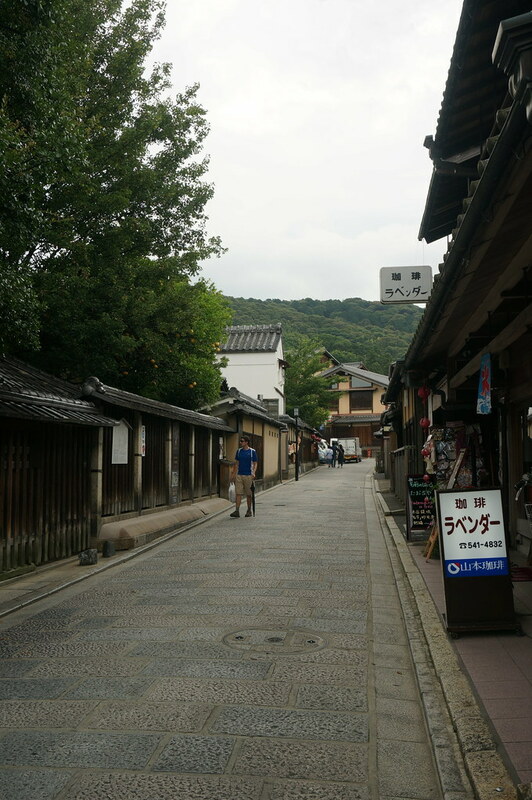 This area of Kyoto was full of bakeries and patisseries, good ones that use real butter. Yummy! 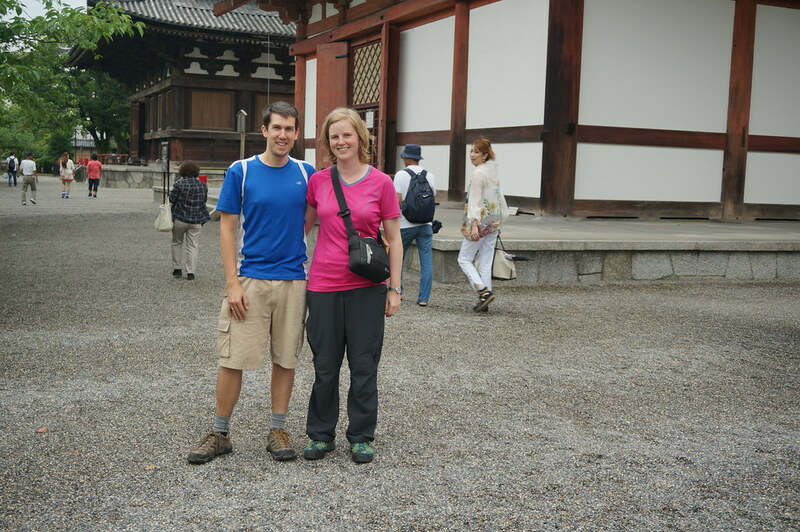 Our first stop was the To-ji Temple, which has a history dating back to the 8th century. 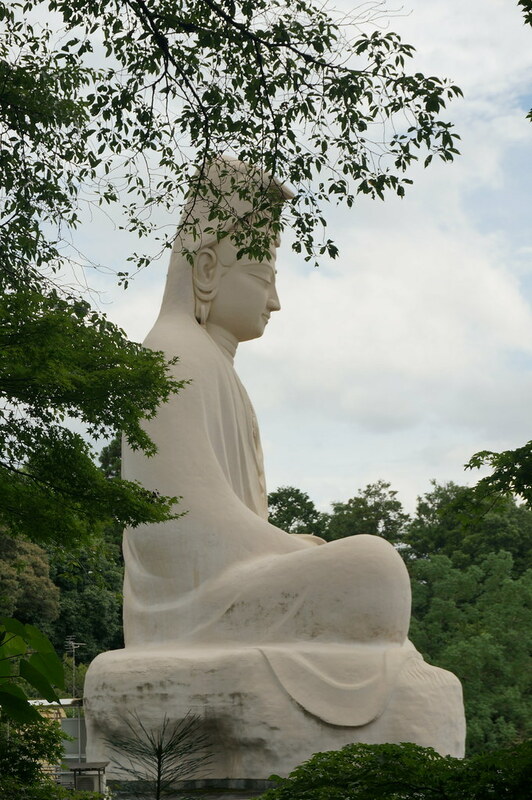 Whilst Europe was in the dark ages, Japanese Emperors were embracing Buddhism, with the religion ‘coming’ to Japan from the Korean peninsular, which in turn came from China and Sri Lanka. 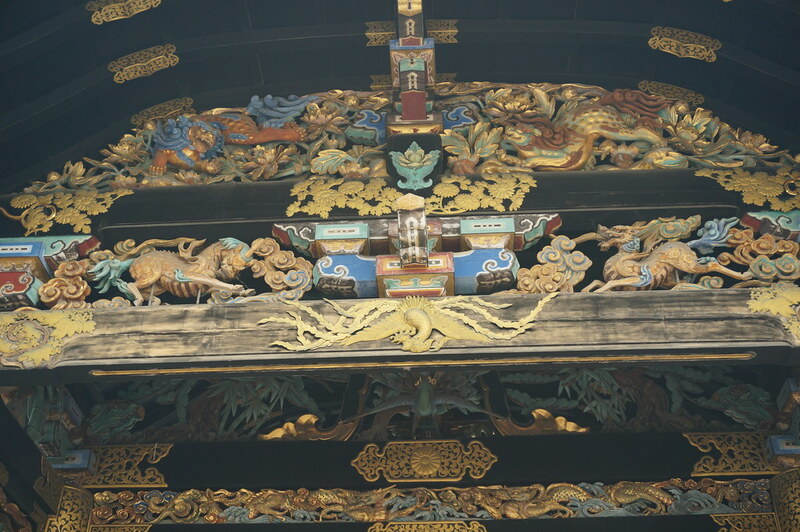 Many cultural relics from China were brought to be housed in this temple complex and were housed in two huge halls. Imagine an 8th century peasant coming to pray for a good harvest coming here. He’d be awestruck! The original halls unfortunately burnt down. 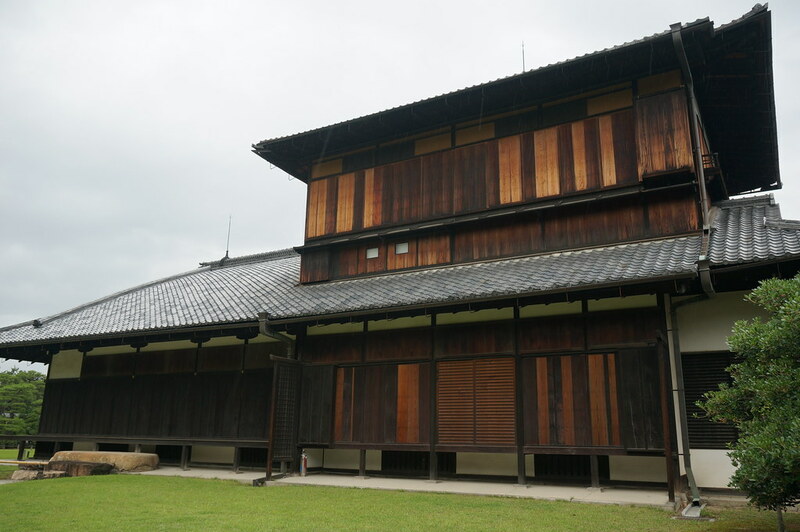 The main hall was reconstructed by Toyotomi Hideyori in 1603. This is the hall we saw on our visit and it was very impressive. 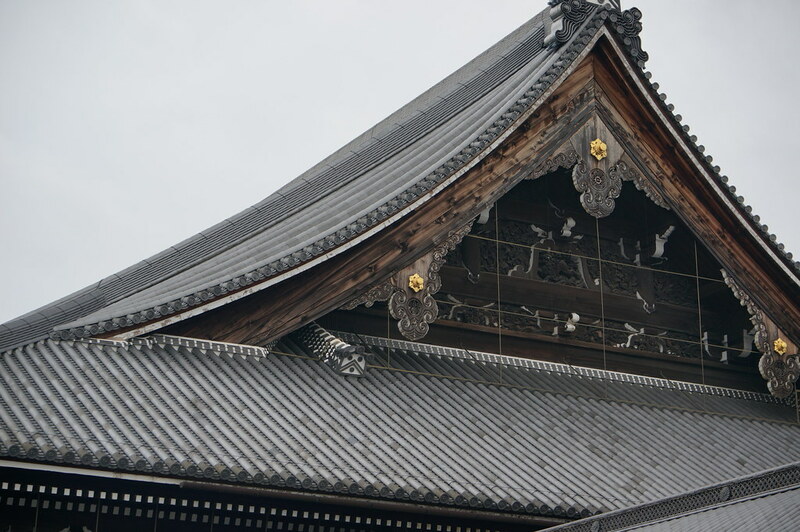 Solid, dark wood with ornamental tiles on the roofs in a style called Irimoya. Inside there were lots of fanstatic carvings of Buddha and his followers but no photos were allowed. 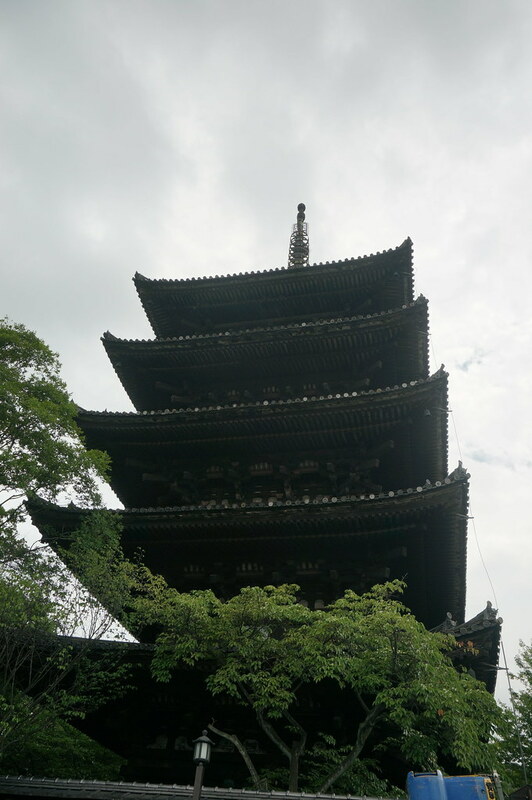 We then wandered to see the five-stories pagoda, which I thought was a very impressive site. 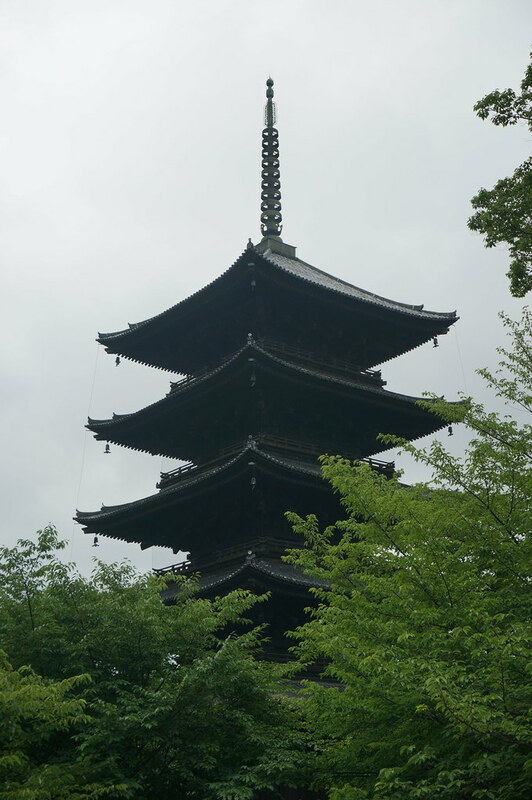 It stands at over 30m in height and claims to be the highest pagoda in Japan. Controversy exists because at the top is an ornamental metal pole, should this be included in the height or not? The original was built in 826AD and has since burnt down. 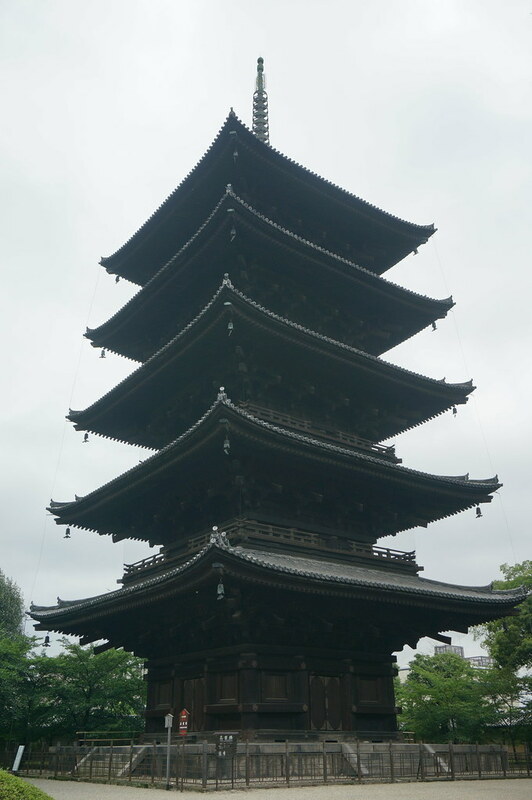 The present pagoda from 1644 is the 5th reincarnation of the original. Andrew and I struggled to think of anything in the UK or Europe from this time period made in the Anglo-Saxon period that still exist. Then again there are not many buildings from this time period that have survived, even the Churches of the period were rebuilt and reconstructed. 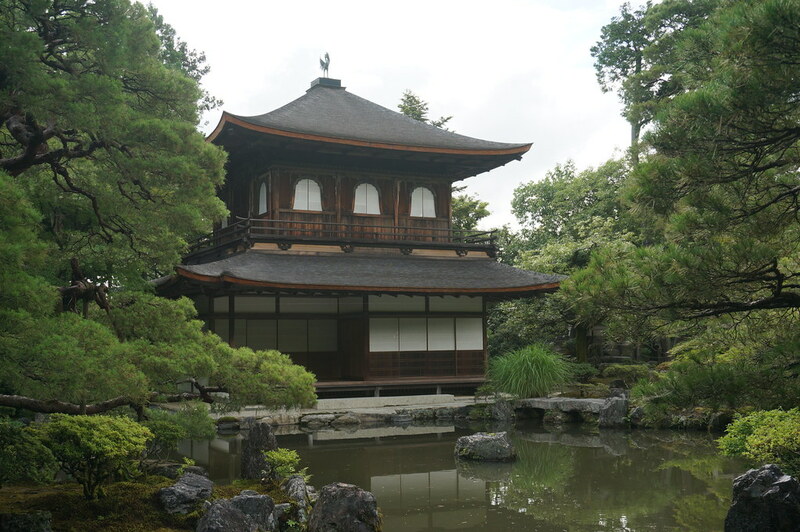 Our first real temple in Japan was, on reflection, a real feat of engineering and devotion to a Buddhism. We then headed for lunch in the train station. The Lonely Planet recommended going to the 11th floor, which we dully did. It took a long time and we took a series of escalators all lined up the centre of the train terminal to reach the floor. I then discovered it was a lot more than I wanted to pay plus it was closing soon. We left and headed towards our next destination, popping into a nearby corner shop to buy lunch. These shops are excellent, offering a range of salads along with ready meals that can be heated up in store. They are reasonably priced and taste nice. 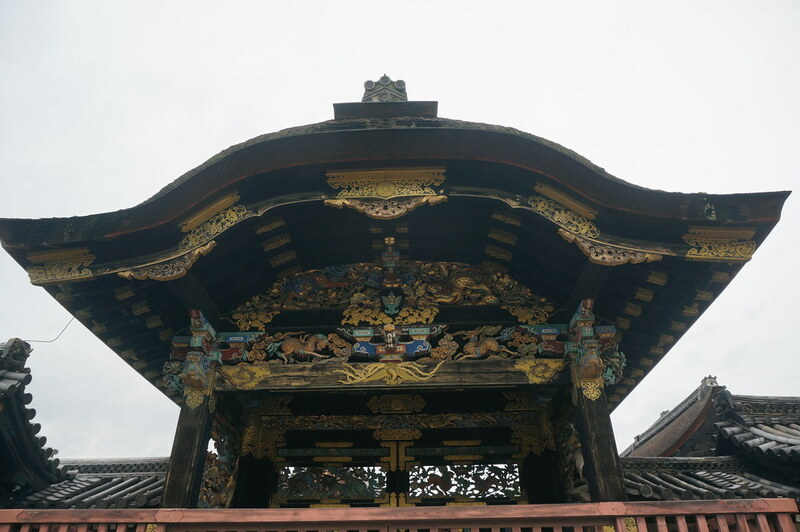 Around 3pm we arrived at Nishi Hongwanji which is a temple complex where Jodo Shinshu is taught. 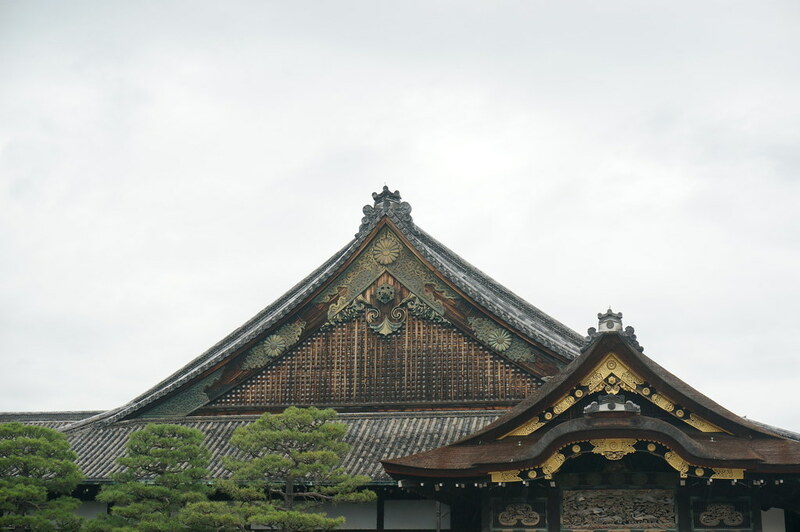 Japanese religion is very confusing to me as there are different parts of Buddhism which then overlap with Shintoism and also Zen Buddhism Not being a scholar of theology and also knowing very little about Japanese history and it’s inter-relationship with religion, I instead enjoy looking at the buildings and save the more academic aspect to later. I woukd however, have liked some more history on the temples. Anyhow back to Jodo, the main jist of Jodo Shinshu is to live life to the full, being aware of the limits and potentials of life. As a result of this and through the teachings of Pure Land Buddhism you can overcome difficulties to reach Nirvana. Very similar to the stages of the path of Tibetan Buddhism and S.E. 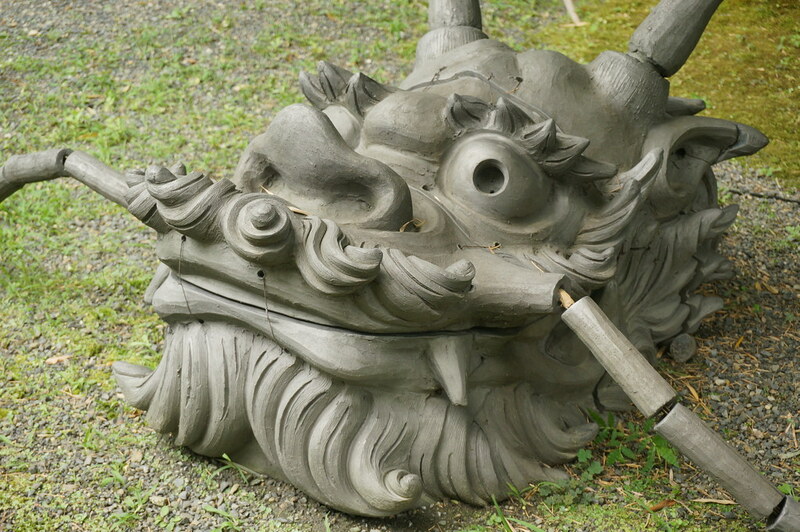 Asian Buddhism. 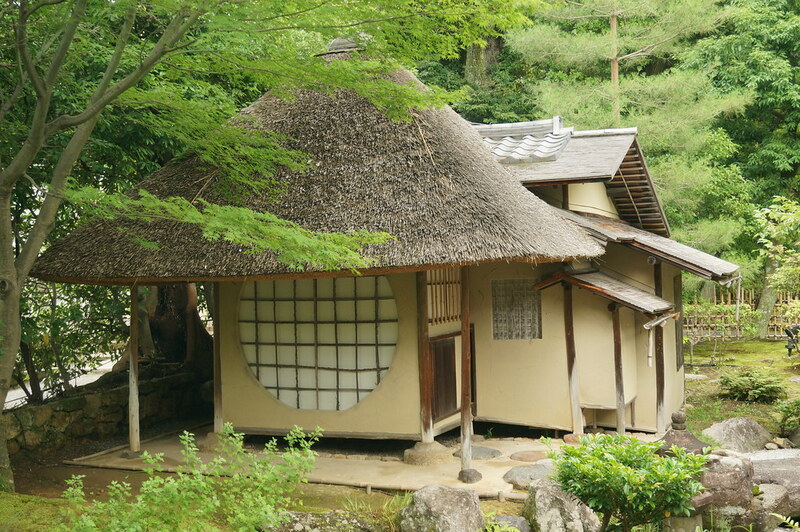 Nishi Hongwanji is an active centre of learning and teaching. It has two very large halls, again both are wooden. They were constructed in 1636 and 1760 respectively. 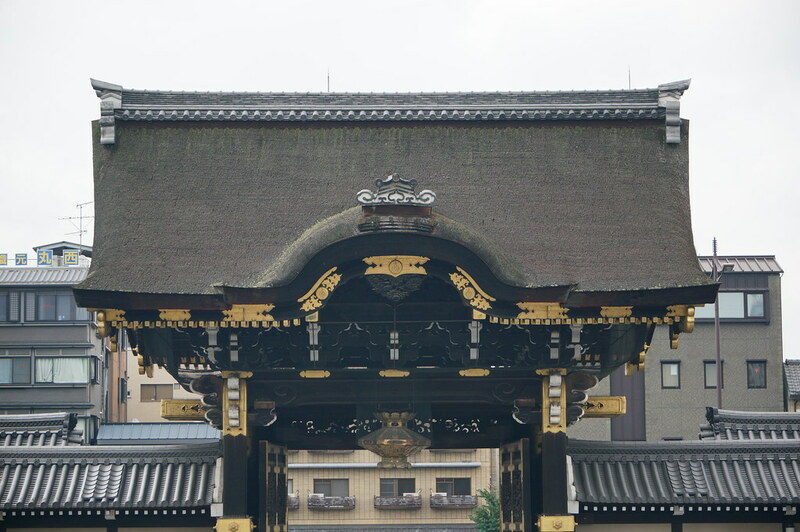 The gates, or Karamon, were very nice to look at. We wandered around, again there was not much information. Just some very large buildings. We ended the day in a cheap katsu curry house. Breaded pork with some curry that tastes like my Dad’s homemade curry and rice for 800 yen or £4. Another tiring day! 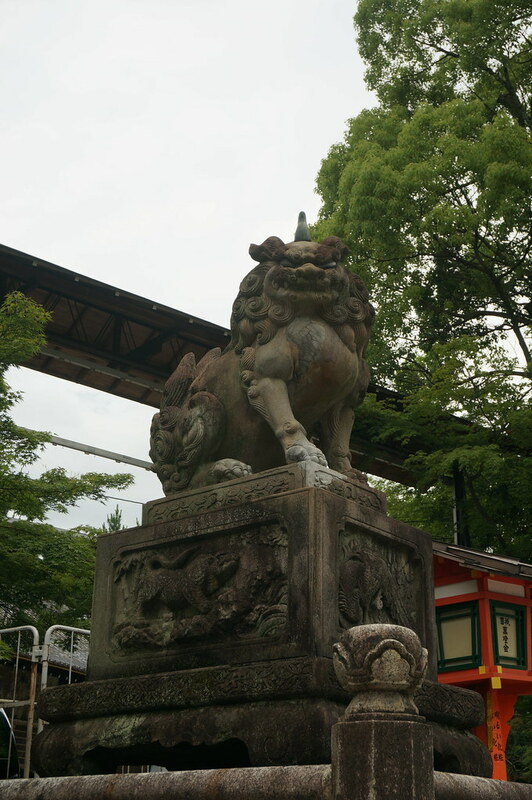 I planned to do a walking tour to the nearby temple complexes and then take a bus to the other side of Kyoto. The day before had taught me that 3 or 4 temples a day was sufficient since most close at 5pm with last entry around 4.30pm. I cut down the itinerary, we still didn’t complete it! A disappointing start to the day as the crossiant shop didn’t open until 11am. This was followed up by us trasping in the hotel 3 times to get hats as it was hot then a postcard to post and something else, don’t know what. We grabbed a yogurt for breakfast and then walked through the streets of Gion, famous for Geisha. 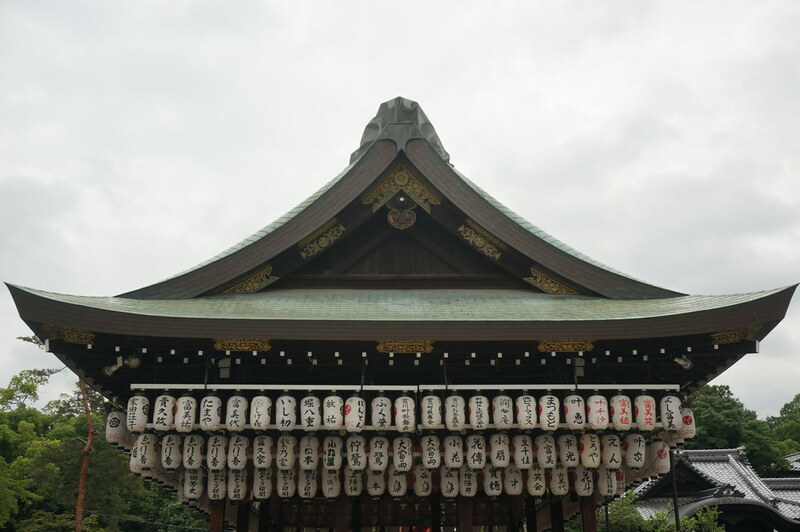 Our first point on the tour was Yasaka Shrine. 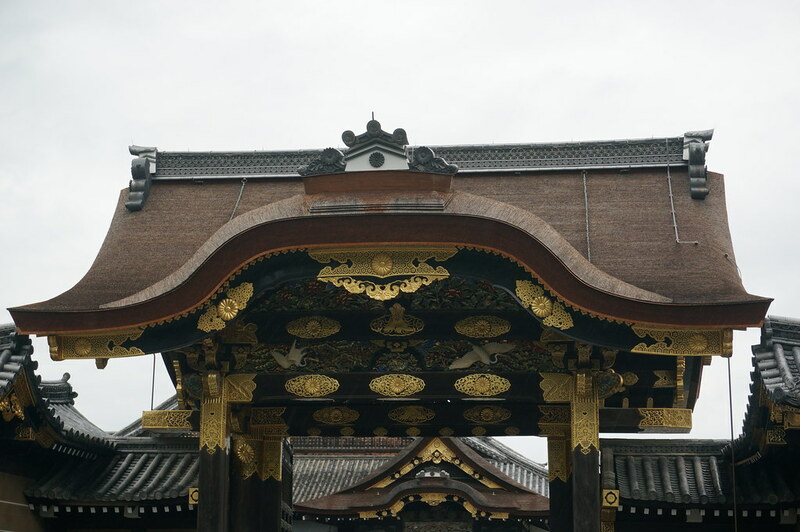 Built in 656AD, it became a shrine of the Imperial government and then in the 20th century a shrine for the military to worship at. 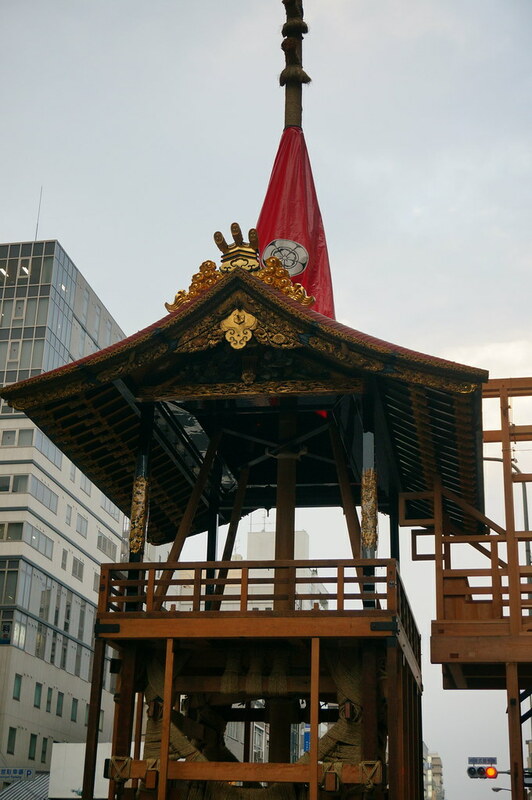 Today, it is the centrepiece of Japan’s top festival, Matsuri. 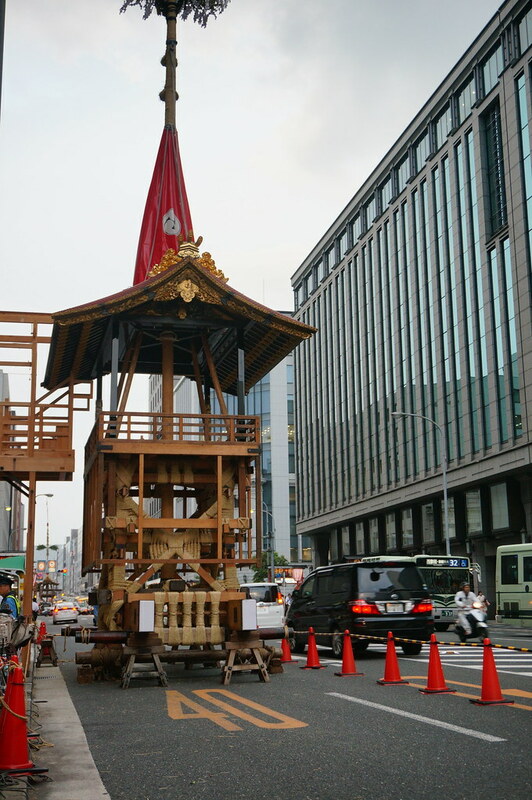 Mikoshi, which is a portable shrine were sent out of the to ward off an epidemic. This continued every year and now has become a big festival. It was a fairly small place but nice enough to pass through. We then reached the neighbouring pagoda, surrounded by townhouses! 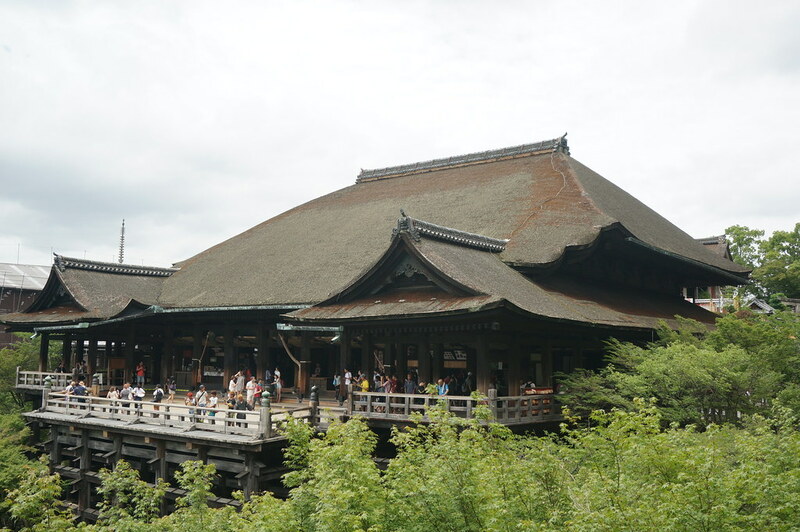 When we arrived at Kiyomizu-dera, we had forgotten the story about the rather large platform that made it famous. The present building contains no nails and was built in 1633. 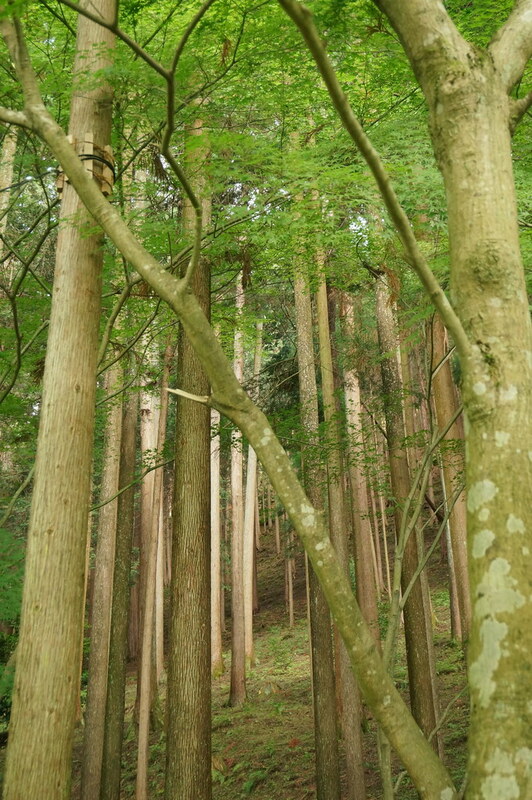 The wooden stage or platform rises 13m above the hillside and it is said that if you can jump off and survive then your wish would be granted. 234 jumpers with 85% success rate, or survival rate as it didn’t clarify details as to their injuries. The practice is now banned. There is also another story about a stone. If you can walk between the two stones then your wish will also be granted. The temple had lots of little items of tat to make wishes come true but not much more. 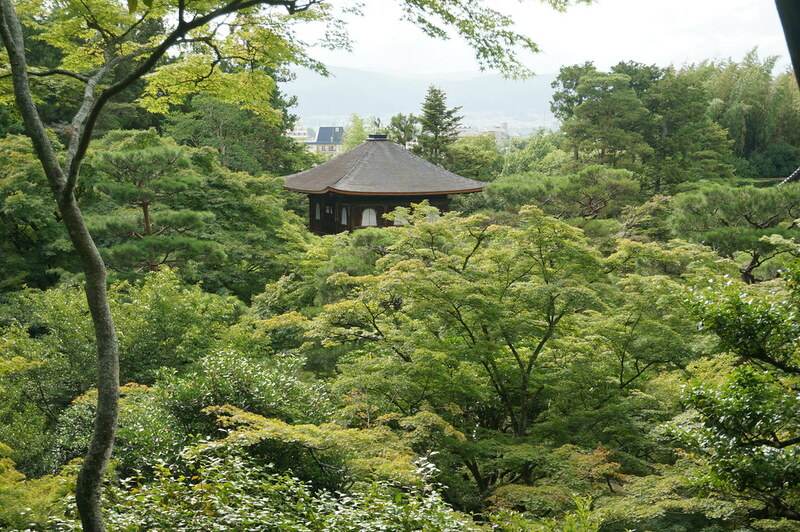 500 yen to wander down a hill to see the hall and you were done. A little disappointing especially after reading all the rave reviews beforehand. Also, when something is designated World Heritage,you expect it to be awe-inspiring. 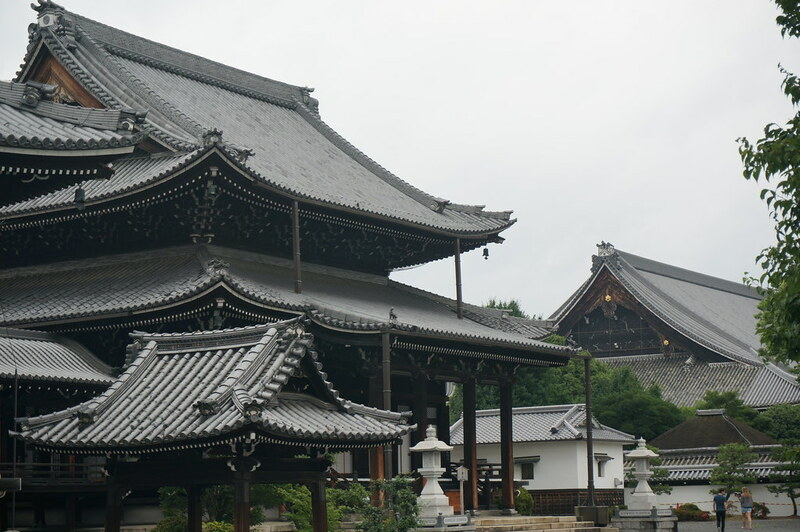 We hoped Kodai-ji Temple would be! 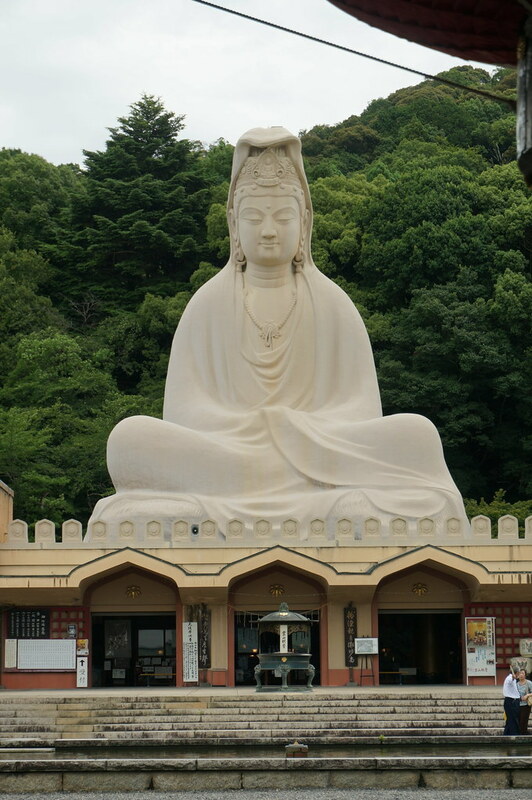 Situated next door there was a large Buddha. We wandered around a bit and took some more photos, some places had exotic names such as ‘ the cottage of lingering fragrance’. 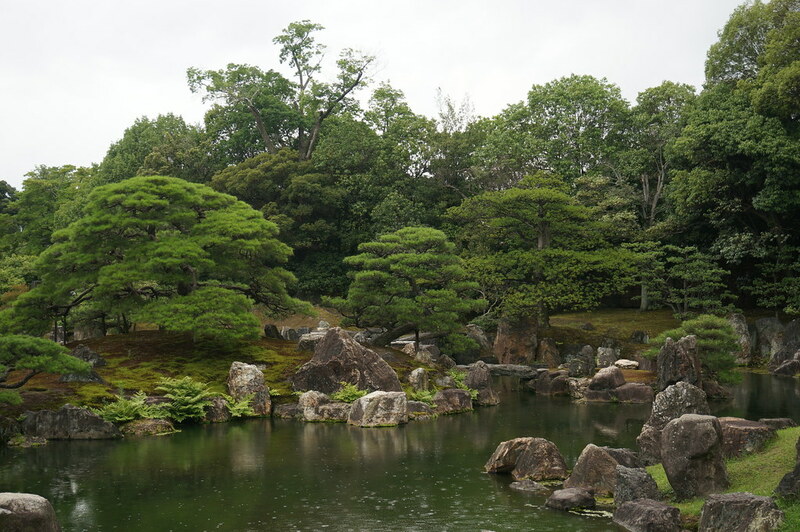 There was a pleasant temple garden here, the island is supposed to represent a turtle. This temple has a love story behind it or maybe a tale of duty. Built in 1605 at the behest of a noblewoman for her late husband in his memory. 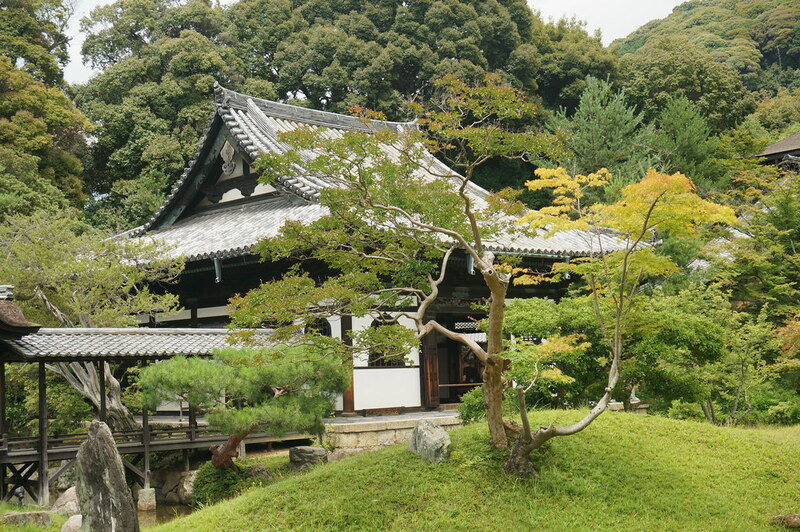 It houses a very nice garden and also became the seat of the Abbot of a nearby temple. After ensuring her husband had a nice garden built in his name the noblewoman did her duty and became a Buddhist nun as was the requirement. So she didn’t get to enjoy it but the Abbot did. It was quite a small place but tranquil due to the fact it was raining so no-one was around. Most temple complexes and gardens we visited were a pleasant experience because they only had a handful of people in them. Even the most popular places had pockets of garden where you could sit and relax. This was much better than the gardens we had visited in China. We didn’t have to force our way to a viewing area and then shove past a gaggle of tourists blocking the way. There were no tour groups with a tour leader talking through a megaphone, just calm most of the time and people generally tried to let you take a photo, well the Japanese people did. How very polite indeed. We then headed down the very busy touristy street and I spotted a fan shop. I was hoping to find a cheap fan to keep me cool. It was boiling hot with the humidity through the roof. I perused and decided they cost far too much for a fan. Heading for the door I spotted some fans with some images of Mount Fuji on, I succombed and bought one as an ornament. Heading out with my nicely wrapped fan we set off for lunch and to the ‘Silver Pavilion’. We popped into Lawson, another corner shop, to get a quick lunch. It was now 2pm. 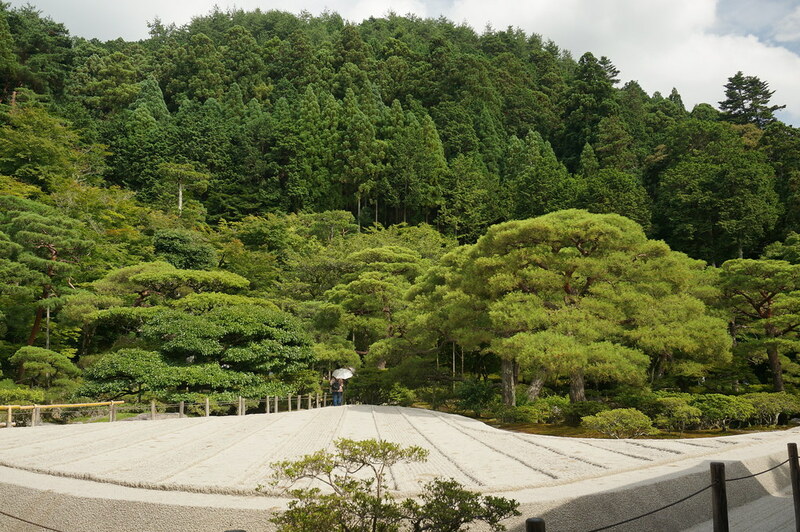 I decided we should skip a wooded area of temples and make our way to another World Heritage site. The last couple had been nice enough but nothing spectacular. I hoped the next place would be. We decided to get a bus as it was 3km away, usually this would be fine but it was so hot. The buses are extremely easy to use once you find a stop with you bus number on. Once on the bus, which you enter via the middle, you have a screen with destinations in English and Japanese. The microphone system also calls out the stops and for tourist hotspots it also announces in English. 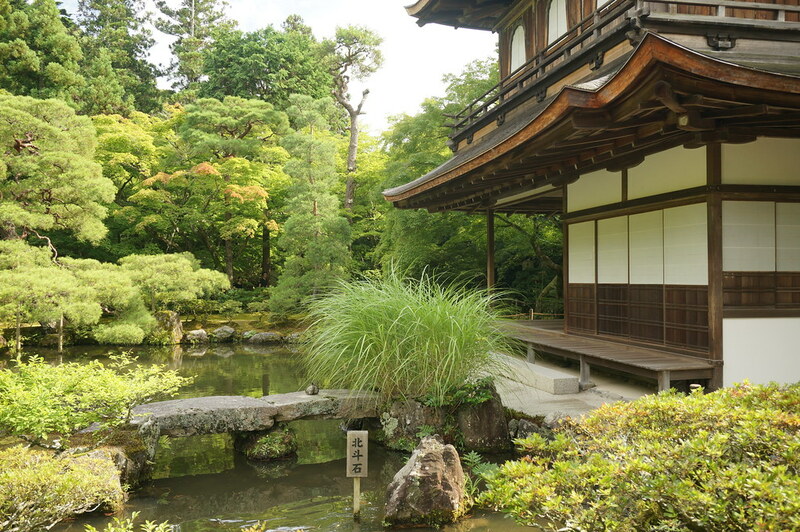 We headed to Ginkaku-ji, commonly known as the Silver Pavilion. 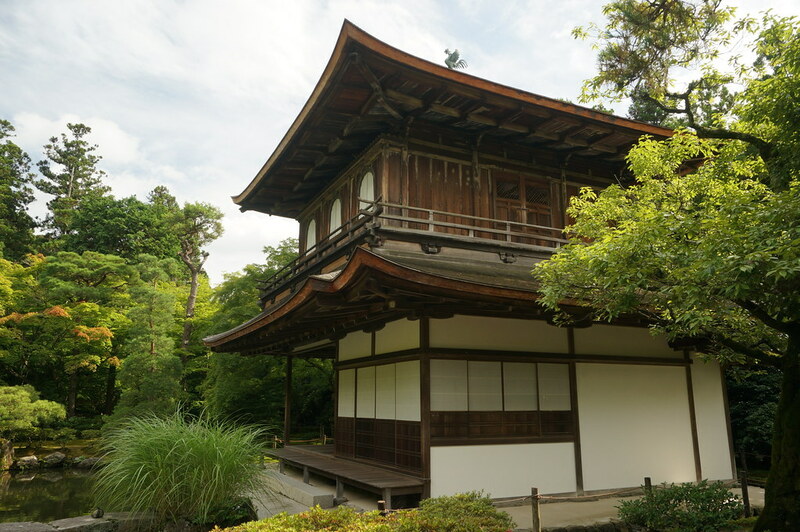 It is a Zen temple and was built as a retirement home for the Shogan. A misnomer indeed. It was supposed to be covered in silver but it never happened. Andrew says his house shall be known as the golden house because he did intend to cover it in gold leaf but never got around to it. 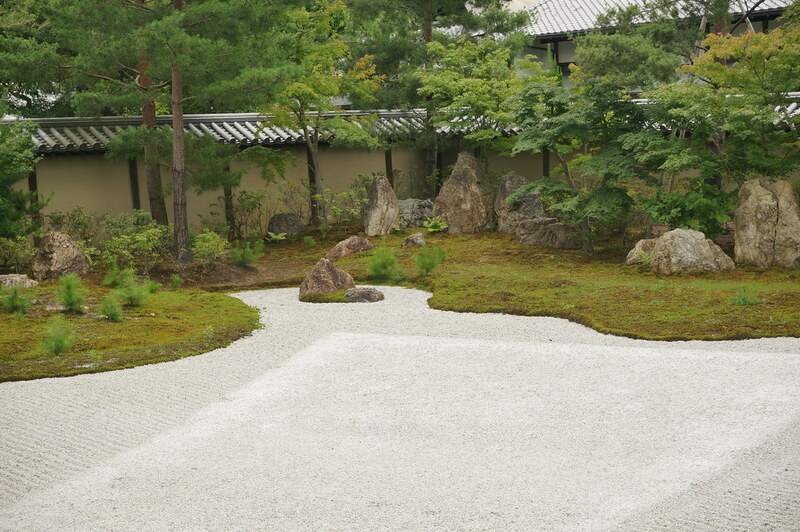 We sat looking at the Zen garden, which consists of white gravel being neatly raked and is called ‘sea of silver sand’. 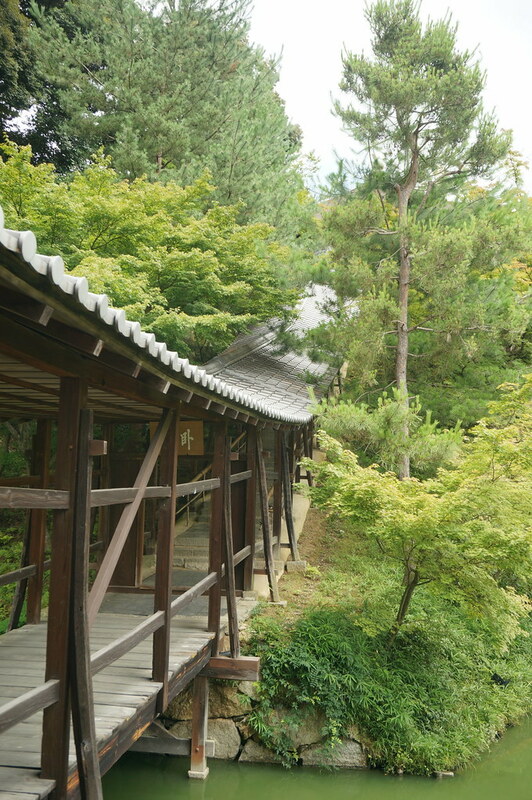 There is also a gravel mound known as ‘moon viewing platform’. 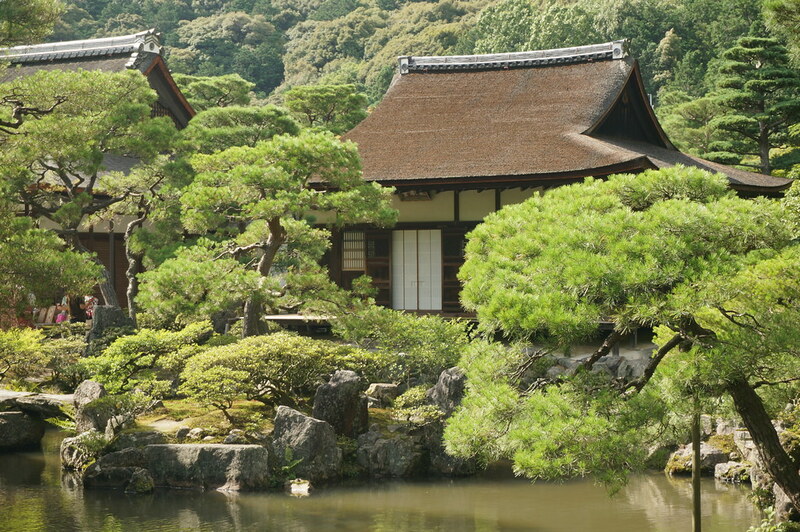 Zen Buddhism became the ‘in thing’ among the Samurai class in the 13th century with rock gardens reflecting the central theme of self-discipline. The aim of the garden is to reduce the natural world to abstract forms e.g. 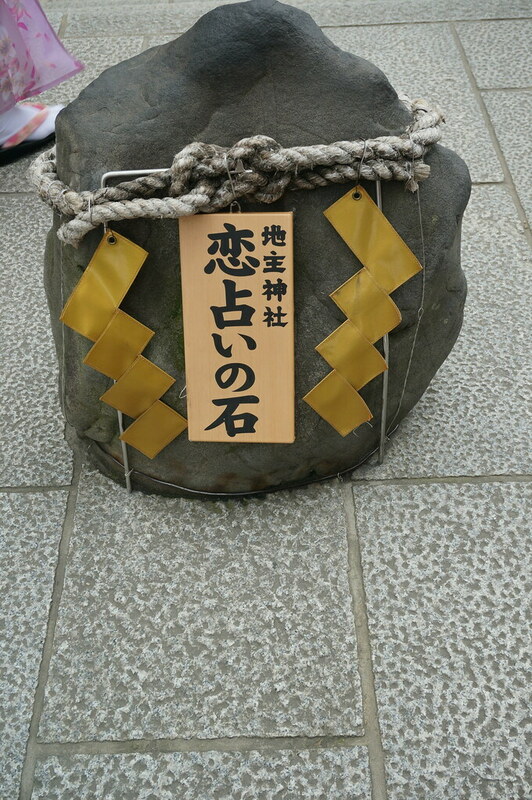 a rock may represent a tiger and the gravel may be the ocean. It is supposed to allow meditation due to it’s simplicity. 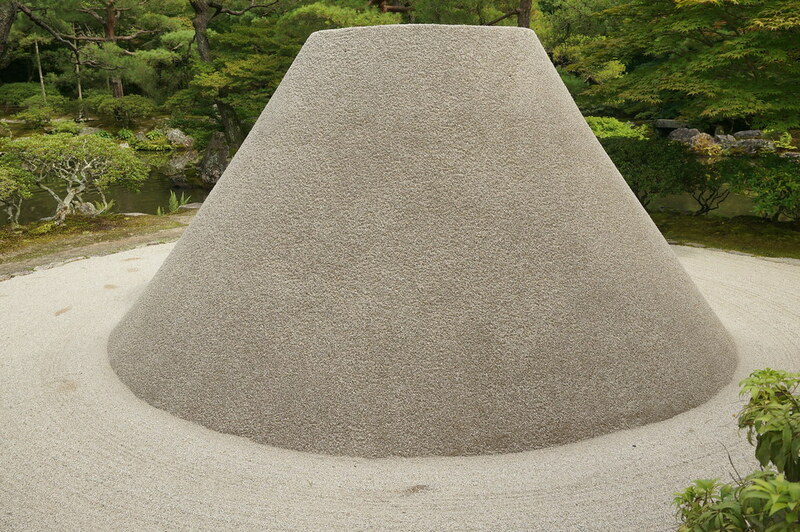 A guessing game usually ensues when we see a Zen garden as to which rock is what, but I suppose it achieves part of its goal, as it makes you think. I never got to the meditation part and thus have not yet achieved Nirvana. 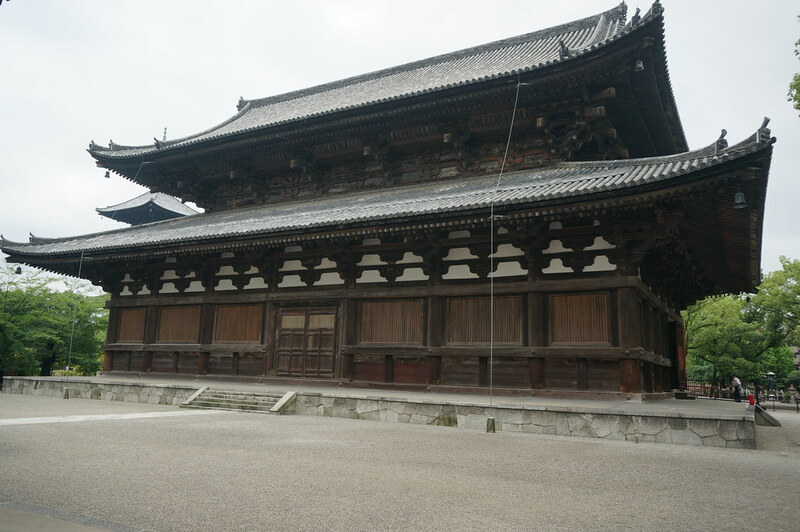 We then moved on from the two remaining wooden temples. The rest having been,once again destroyed by fire, and walked through the moss garden. Another small garden and again reasonably nice. Each place costs £3 per person. Visiting a few sites adds up and when you only spend 20 minutes it is a little frustrating. Places give you an information leaflet but I do feel without context of the places it is hard to appreciate some of them. For example, if I gave you a piece of a wood and told you it was the most wonderful artefact ever. You’d probably not agree but if I then told you it was from King Alfred the Great’s throne and told you about why he was such an important king who united England, you might appreciate it a bit more. At the time it was hard to comprehend how important some of these sites were, but on reflection and considering the date of the temples and surrounding context it means a lot more. 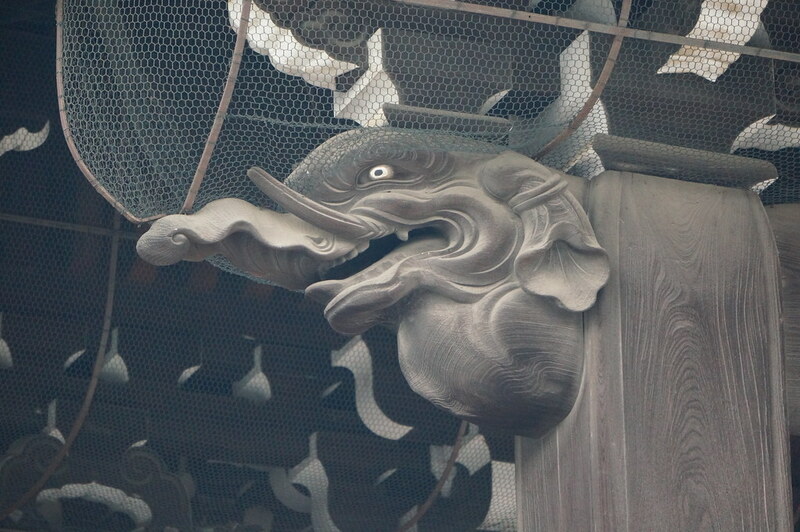 I looked forward to our next day of temples. 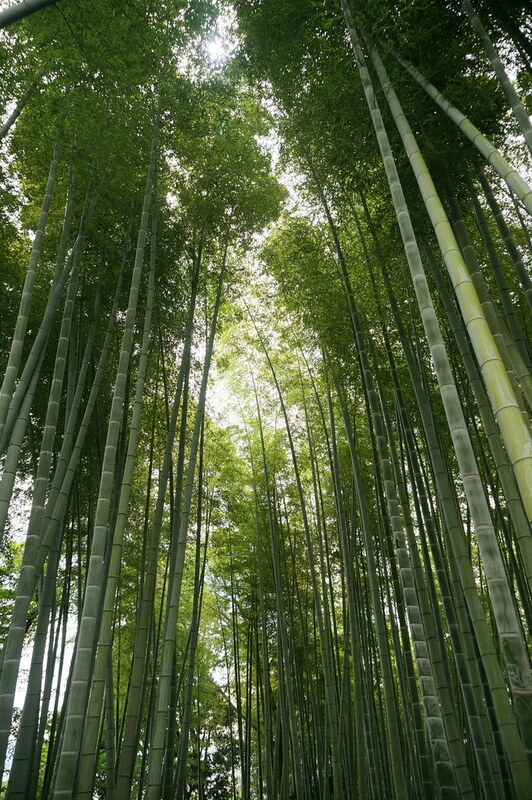 Posted from Kyoto, Kyoto Prefecture, Japan.